LEWISTON, Idaho – Nate Jestes likes to take on a little work before he has some fun. It’s an approach that has worked well for him during this inaugural Bullfighters Only season, and he proved it again over the weekend during the BFO tour event in conjunction with the Lewiston Roundup. Jestes was one of the protection bullfighters during the rodeo, then was part of the freestyle bullfight directly afterward. 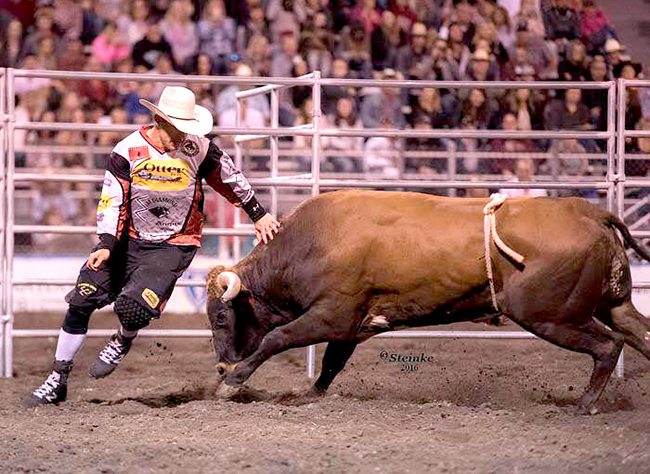 “By working the protection side, it gets me to where I’m moving around the bulls and reading the bulls before I ever move over to the freestyle bullfight,” said Jestes, who posted an 88.5-point fight with 12x and Costa’s Anger Management to win the title. By earning the Lewiston crown, he added $3,500 to his season earnings and returned to the No. 1 spot in the Bullfighters Only standings with $22,575. He owns a $1,838 lead over the No. 2 man, former leader Cody Webster of Wayne, Okla. Throw in Weston Rutkowski of Haskell, Okla., and Ross Hill of Muscle Shoals, Ala., and it’s been a solid race for the top of the leaderboard much of the season. “That has been fun,” said Jestes, who held the top spot for much of the season after winning The American in Arlington, Texas, in the spring. “With the bullfighting tour being absent for 16 years and this being the first actual tour of scheduled events, it’s been a great thing to see. Jestes went through several twists and turns of his own during his bout with Anger Management, a little red bull that proved to be solid. It worked well. Jestes threw several fakes at Anger Management, then lined out a jump before closing out the fight with a solid fake. So did Jestes, who returned to the top of the game.